1. How it got my attention. 2. Why I pulled the trigger. Hmmm. I may start conflating points 1 and 2. It seems I have a "hair trigger" when it comes to things that get my interest, though paying this self-imposed blog tax on products may change my habits in the future. I pulled the trigger because of the cover art, the comments at RPGnow, and the low price. C&T uses 0e D&D basics (by way of the Swords & Wizardry retroclone), the Moldvay B/X sensibilities (layout, art, and general feel), and molds it into something more personal than a generic retroclone. 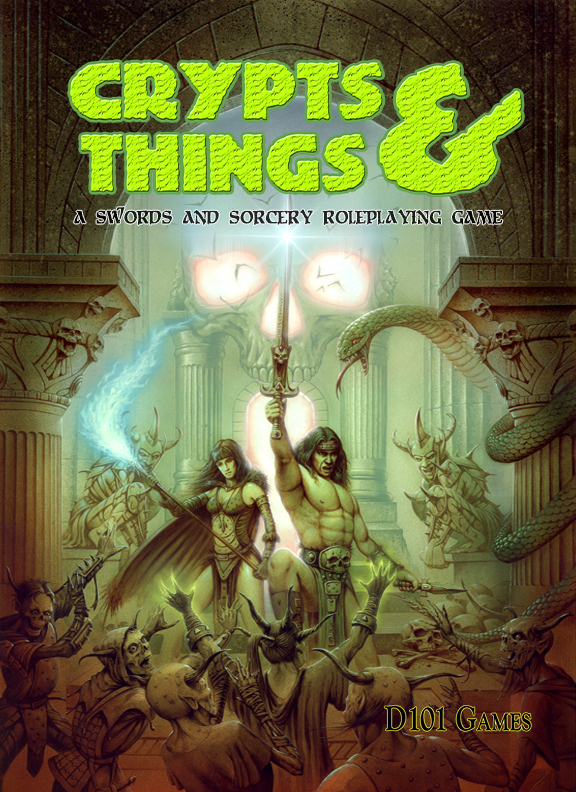 Specifically, it claims (and succeeds) at being a "swords and sorcery roleplaying game." It definitely has a Robert E. Howard vibe, more than any other S&S author. If you find yourself wondering about some of the choices, where the rules drift away from traditional D&D, consider them in the light of S&S (rather than high/generic fantasy) and you'll understand them. The book begins with a bit of intro fiction and some obligatory stuff about roleplaying games and dice. We can skip over that. But then it does something I appreciate, which is to explain the structure of the book in one page (page 6, for reference). In fact, I find the sectioning and flow of information in this book to be very well done. It is divided into The Scrolls of Wonder (players' handbook) and The Book of Doom (game masters' guide). In the Scrolls are sections for creating characters, classes, life events (a kind of life-path method of generating back story), spells, rules for combat and sanity (yes, sanity, but I'll get to that), an overview of the world and its cultures. The Book of Doom contains more info about "Zarth's Continent of Terror." It has "Secrets" that can be used to generate adventure hooks and themes, a section on dealing with the "Others" (demons), five "Scourges" (evil villains), and some details on the Serpent Men (a major sub-theme of C&T). After this world guide comes a bestiary and section on treasures (how to generate and specific fifty specific items). Finally, there three - count 'em, THREE - sample adventures: an underground adventure, a wilderness adventure, and a city adventure. Brilliant. I could get crazy and write a full review, but this is supposed to be impressions. So here are some random thoughts I have about the book, mostly positive. Solid art, layout, etc. It's very readable as a text. Sections are "right-sized" - not too long or short. The rules are definitely old school. They aren't complicated or crunchy, but they have old school style quirks and tables. I like the simplicity. I'm not sure about some of the choices (like descending AC, though that is easily fixed). There are a couple major changes to stats. Wisdom essentially doubles as Sanity (Cthulhu style). And there is a Luck score. Both of these are resources you can wear down. I see shades of DCC influence here. * I like representing Sanity; I'm unsure about tying it to the Wisdom score, but it feels like a solid choice to model sword-and-sorcery fiction. The "exotic classes" are Beast Hybrid, Disciple (Monk), Elementalist, Lizard Man, and Serpent Noble are added. These are essentially classes that make sense in the setting. The classes have some exception-based power lists to choose from that feel a bit like 3.x feats. For instance, fighters pick from a list of styles, disciples pick from paths, etc. It's not unwieldy though. Spells are generally "gray," but there are some white magic spells that may attract the attention of the Others (demons) and black magic spells that can cause corruption. The spells are mostly D&D wizard and cleric spells all smooshed into one list. Cool. I like it. You basically configure your magic-user class with your spell choice. The life events are cool. They not only give you some back story but they ground you in the world. Here's an example, "You saw your family sacrificed by the Priests of the Five Tent Camp and swore vengeance." Luck is a roll 2d6 < stat mechanic. Skills are a d20 +/- mods ≥ Skill Number (a character stat). Sanity is ... a little odd, but workable. You begin with points equal to your Wisdom. When you see something awful, you test your Luck. If you are unlucky, you lose d6 points of Sanity. NPCs and monsters die when their HP = 0. Characters start taking CON damage and test their Luck each time to stay conscious. CON heals more slowly and must be healed before HP. So get the hell out of a fight if you get below 0 HP! The world stuff is generally cool. I especially like the "What the elder told me" section, which gives you cool bits of info about the world based on what region you grew up in (determined by your life events). All of that is in the Scrolls. I did not read the Book of Doom, I only glanced through it. Why? Because if my group plays this and I'm not the GM, I want to be surprised. At first glance, the Doom part of the book seems just as cool as the Scrolls part. And I really applaud the inclusion of three short adventures highlighting different zones of the world (dungeon, wilderness, city). If you like OSR games and Conan stories (or sword-and-sorcery in general), this book is an auto-purchase. * I was wrong on this count. Newt says: "The Sanity Rules were originally from Arkasia's S&W Swords & Sorcery House Rules Index, as were a few other bits and bobs, rather than DCC (akraticwizardry.blogspot.co.uk - ‘Swords & Sorcery’ House Rules Index). The whole Luck mechanic was adapted from the good old Fighting Fantasy gamebooks rules."